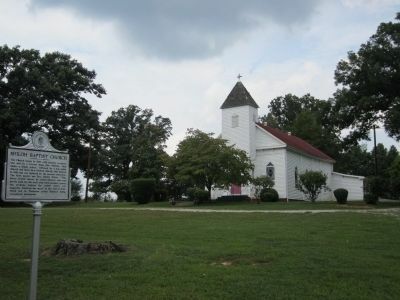 The Church began in 1866 with seventy ex-slaves who met in a private home (Doc Walton), then under a brush arbor, followed by a log cabin church and later in a framed church; this burned in 1898 and was replaced by the present structure. The first pastor was Rev. Daniel White. “The River Jordan” mural, by Julien Binford (who was partly paid for his work with farm produce) graces the archway behind the pulpit (1942). Life magazine featured the mural in the Fall of 1942, which led to Powhatan artist Binford being recognized nationwide. Erected 2007 by Michaux-St. James Foundation, Inc. Location. 37° 37.169′ N, 77° 52.141′ W. Marker is near Powhatan, Virginia, in Powhatan County. 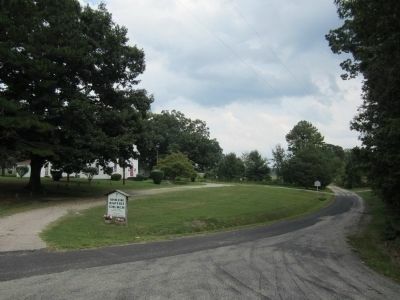 Marker is at the intersection of Monte Road (Virginia Route 633) and Old River Trail (Virginia Route 617), on the left when traveling east on Monte Road. Touch for map. Marker is in this post office area: Powhatan VA 23139, United States of America. Touch for directions. (approx. 2.6 miles away); Lee's Last Camp (approx. 2.6 miles away); Monocan Indians Village of Pineville (Michaux) (approx. 2.7 miles away); Michaux Grant (approx. 2.7 miles away); The 1936 Virginia Prison Recordings (approx. 2.7 miles away); Early Transportation on the James River (approx. 3.4 miles away); Maidens Adventure Hotel (approx. 3.4 miles away). Touch for a list and map of all markers in Powhatan. More. 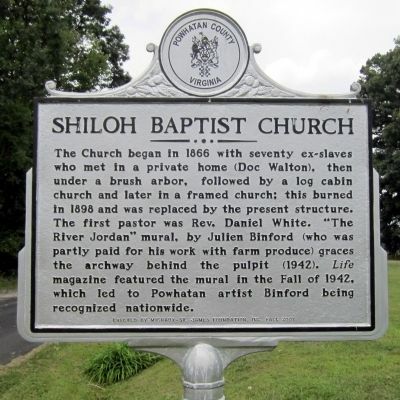 Search the internet for Shiloh Baptist Church. Credits. This page was last revised on June 16, 2016. This page originally submitted on September 6, 2011, by Bernard Fisher of Mechanicsville, Virginia. This page has been viewed 783 times since then and 15 times this year. Photos: 1, 2, 3. submitted on September 6, 2011, by Bernard Fisher of Mechanicsville, Virginia.